View of farm fields & Gulf of St. Lawrence from John Macneill home. The photo above shows the view from the location of the bedroom of author, L.M. 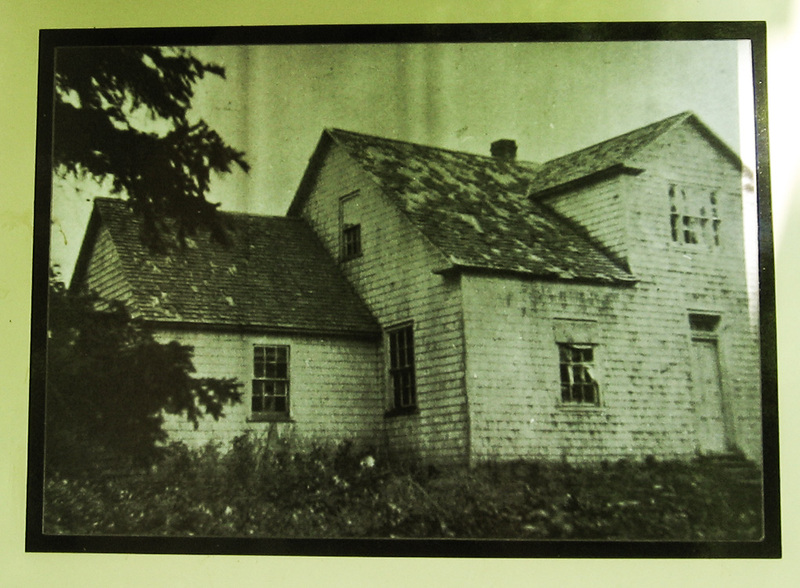 Montgomery, at her Macneill grandparents' home in Cavendish, Prince Edward Island (a reverse view toward the house is at the end of this page). 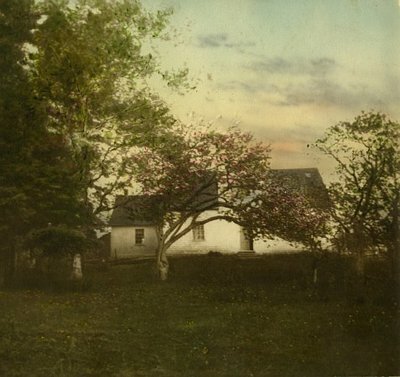 In spite of modern development, the landscape is much the same as it was in her time in some places because the Macneill family still owns the fields around the Homestead. Montgomery lived with her maternal grandparents because her mother died when she was very young and her father spent years establishing a career, many times moving between PEI and the western provinces. Montgomery was raised mostly by her Aunt Emily Macneill until Emily was married when Maud was about 10 years old and left the Macneill farm. Maud lived with her "grandmama", Lucy Macneill, and grandfather, Alexander, except for ages 16 - 24: she lived with her father for a year in Prince Albert in 1890, took teacher training at Prince of Wales College and taught in Bideford, PEI, took classes at Dalhousie University in Halifax, NS, and taught school in Belmont and Lower Bedeque, PEI. When her grandfather died in 1898, she returned to the Homestead to take care of her grandmother until her death in 1911. As an adult, she grew restless living alone with her grandmother but she always retained an intense love for the place where she grew up and where she wrote her first four books. 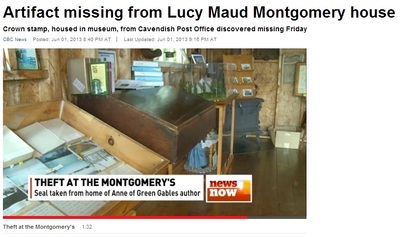 She wrote Anne of Green Gables in the old kitchen which also served as the post office for the community. After her grandmother died, Montgomery had to leave the house very quickly because it was owned by her uncle John Macneill who lived nearby. 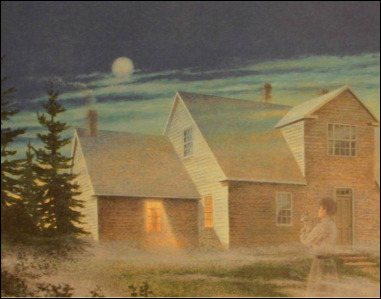 She moved to the home of her Aunt Annie Macneill Campbell in Park Corner where she was married. Afterwards, she lived with her husband in Ontario and returned as often as she could to Prince Edward Island. The house where L.M. 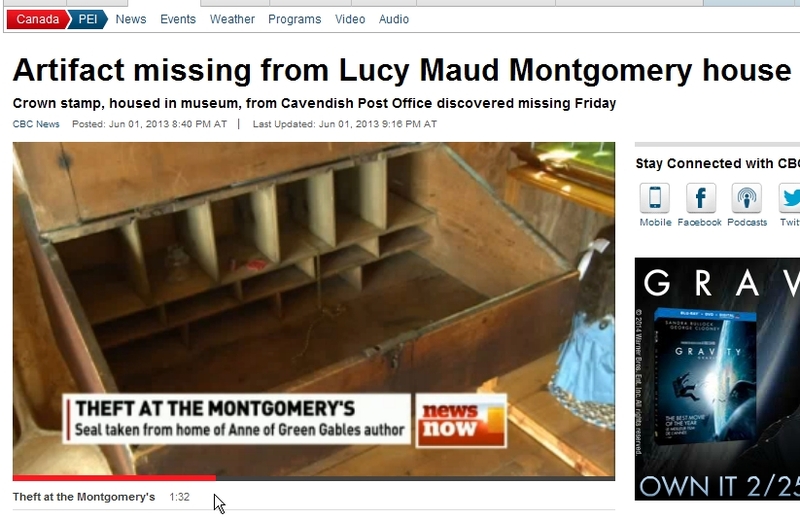 Montgomery grew up was left empty and eventually taken down after she became famous. 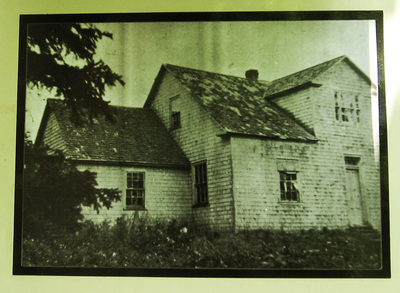 Uncle John's grandson, John, lived on the family property with his wife Jennie Moore Macneill, a retired teacher. John's father, Ernest, was LMM's 1st cousin, "A letter from Myrtle came today, saying Ern Macneill's wife had a son. So perhaps the old place may remain in the Macneill name yet. I hope so anyway" (Selected Journals of L.M. Montgomery, Vol 4. p. 63). Jennie grew up on a farm by New London Bay, behind the Cavendish shore dunes until it was taken over by Parks Canada. She used to visit the site of her old home by walking on the Homestead Trail (this part of the trail may no longer be accessible). Jennie attended Montgomery's funeral as a young girl [Amy Brailey wrote a nice post about Jennie's story HERE]. 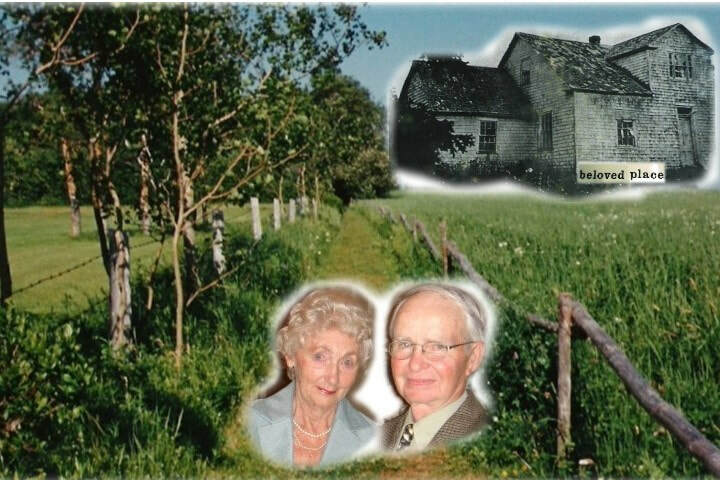 When John and Jennie read Montgomery's journals and learned how much she loved the Homestead, they worked for three years to clear the landscape around the foundation of the old home. They restored the grounds with an authenticity which allows Montgomery fans to experience the sense of place that the author herself felt so keenly. 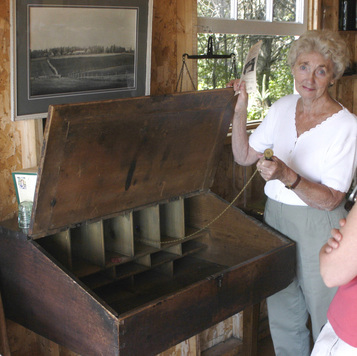 Jennie wrote about preserving Montgomery's "Hallowed Ground" in 2006: Looking Back (p.4). Without the hard work done by the Macneills, Montgomery's beloved place would be lost forever. THE MACNEILL KITCHEN Visitors to this site can immerse themselves in the peace and quiet spaces that Montgomery loved so deeply. The wind rustles through the leaves of trees around the foundation, one of the trees is still in place from Montgomery's time. Although the house is gone, an important part still remains. 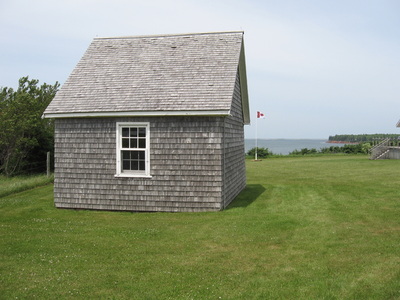 The kitchen where Montgomery wrote Anne of Green Gables is still standing. Montgomery's Uncle John removed the kitchen section of house after the rest of the structure came down in the 1920s, and it was used to shelter some of the farm animals and then as a storage shed by John's son, Ernest. In 1967, the Macneills gave it to PEI historian, author, and educator, Dr. F.W.P. Bolger at his request. He offered to buy it but according to Jennie, "We said we would not sell a piece of heritage - but that he might have it." He relocated it to his summer home to use as a writing cottage. 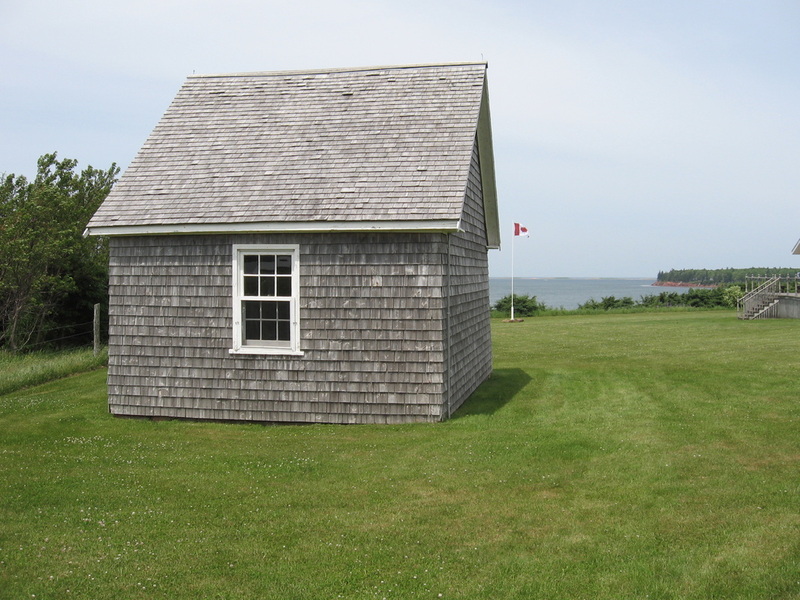 It was common practice for houses and outbuildings to be moved around Prince Edward Island and/or re-purposed. Bolger replaced the damaged floor with boards from his family barn. He carefully cleaned, repaired, restored, and preserved it, using authentic materials and techniques, and put a sandstone step at the back door. He situated it on his property in Stanley Bridge so that he could see his grandmother's house from the window. Dr. Bolger became interested in the life of L.M. Montgomery in the 1970s when he was contacted by Islander William Stevenson to evaluate some letters written by Montgomery to his mother, Penzie MacNeill. Bolger then wrote the book, The Years Before Anne, published in 1974, the year of Montgomery's birth centennial. Ernest Macneill, who died in 1969, told John and Jennie that the shed was the old kitchen, but none of them knew its significance. ​In the 1980s John and Jennie realized the importance of the kitchen and their homestead when the first of Montgomery's journals was published and they read how much the author loved it. Father Bolger and the Macneills were great friends and he always expected it would go back to Cavendish, but even in the summer of 2016 he said he was not ready to see the "sacred kitchen" [always said with a smile] go. He passed away in September 2017. 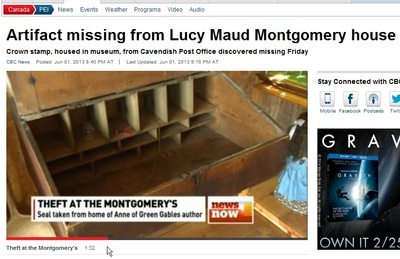 In December 2018 it was returned to the Macneill Homestead as he wished. Tourists can walk from Green Gables, past the cemetery, and up Montgomery's beloved Homestead Lane. Many thousands of respectful visitors have come here. Sadly, a terrible event happened in 2013 when a "fan" betrayed the trust of John and Jennie and Anne fans everywhere. John and Jennie were heartbroken and still devastated years later. Jennie has tears in her eyes when she talks to tourists and explains that the stamp was "taken from us". The stamp, which was chained to the old Macneill post-office desk, was removed by a visitor on 31 May 2013. The visitor returned a second day after her initial visit and conversation with Jennie -- she came into the book store (alone) while the staff was painting outside. She said she was "a friend of Jennie" and wanted to look at a copy of Montgomery's journal which was on the desk (the postal stamp was chained inside). An hour later, the staff person opened the desk and saw the stamp was missing, the chain cut. The artifact is not only a family treasure but also a priceless national artifact. We can only hope this person will have a change of heart, return this small but dear piece of Montgomery and Canadian history, and help heal the sadness and pain this act generated. Please notify us if you see this hand stamp for sale, especially in the Greater Toronto Area and Mississauga, Ontario or Winter Garden, Ft. Lauderdale or Orlando, Florida area. Jennie Macneill holding postal stamp. The old Macneill Homestead, house is on the left. Montgomery's window at the top of the gable behind the tree. Photo from Jennie Macneill. 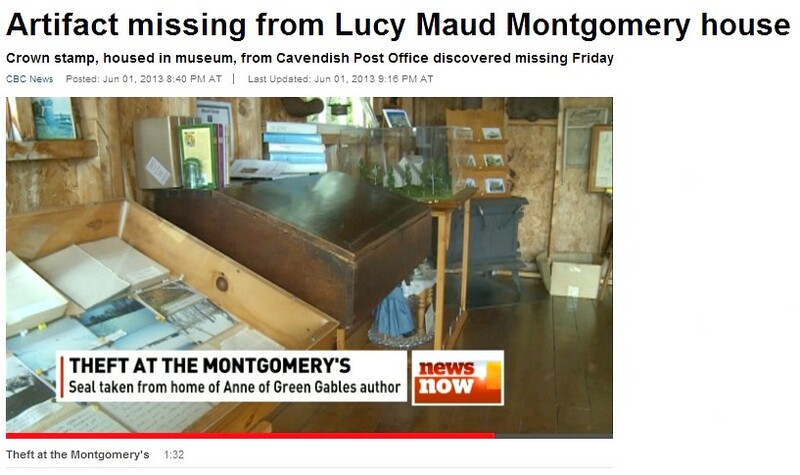 Jennie maintains a wonderful collection of books and we recommend you support the Cavendish Home of Lucy Maud Montgomery when you visit PEI.